Levers, Pegs, Crash Bars, etc. Tanzania is consistently rated as probably the best tourist destination in Africa. 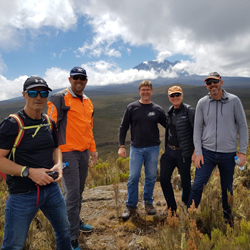 It is home to the highest and largest free standing mountain in the world, Kilimanjaro and particularly known for the rich and diverse wildlife concentrations, mineral and other resources available. Over 25% of the land is protected and amazing safari destinations like the Serengeti and Ngorongoro Crater attrack thousands of international vistors annually. Tanzania will make your dream adventure come true. Normally, Tanzania's safari destinations are divided into three circuits, the Northern Circuit, Southern Circuit and Western Circuit. The Northern Circuit includes the Serengeti along with it's famous wildebeest migration and the Mt Kilimanjaro National Park, making it by far the most popular region. Our expedition will cover the eastern region, north of Dar es Salaam and some of the best areas of the popular Northern Circuit. 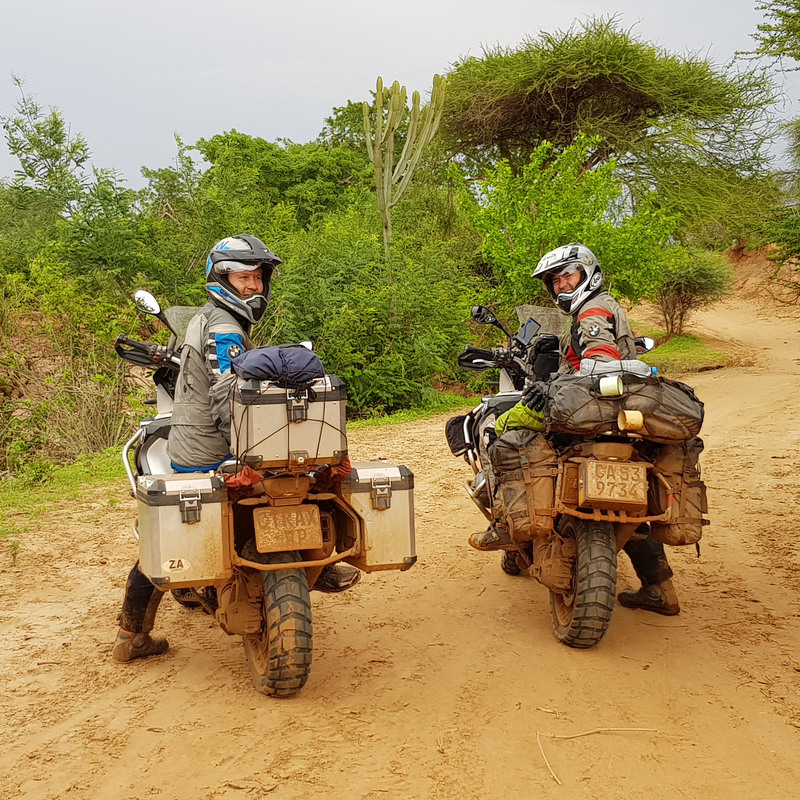 Our Tanzania motorcyle expedition starts in Dar es Salaam, follow a circular route north along the eastern coast line almost to the border with Kenya. We then traverse inland over the Eastern Usambara Mountains and the Pare Mountains. We also circumnavigate the great Mount Kilimanjaro. From there we travel to Karatu and visit the Ngorongoro Crater. Further South we ride through the Mikumi National Park and back to spend our last night at Bagamoyo, just north of Dar es Salaam, from where we fly back. 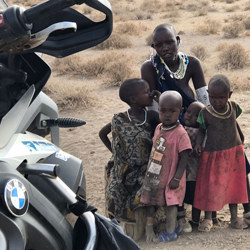 We transport your motorcycle from Cape Town or Johannesburg to Tanzania and back, saving you weeks on traveling time and arrange border papers and third-party insurance on your behalf. Approximately 80% of the trip will be on dirt/gravel roads. Most of the time in the saddle ont his trip will therefore be spend on gravel. The trip is suitable for strong intermediate to advanced riders and is generally not pillion friendly. 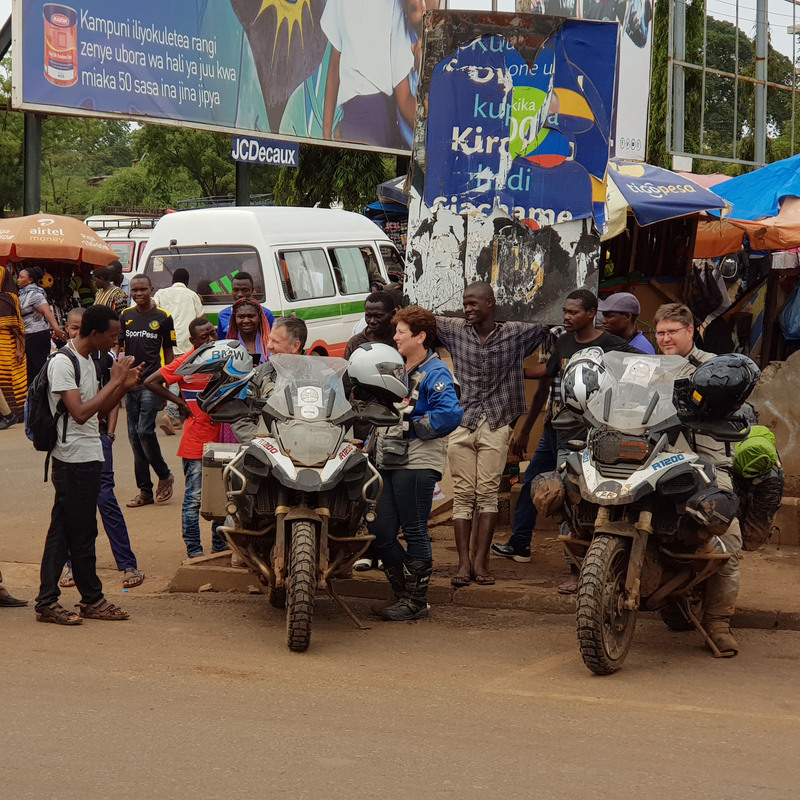 As per all our other tours, groups consists of only 5-8 motorcycles to allow for a more personalised and unique experience. The trip is suitable for strong, intermediate to advanced riders and is in general not pillion friendly. If required, motorcycle rentals can be arranged, which will incur additional costs. 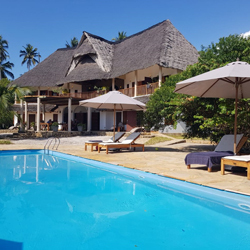 If you want to join our Tanzania expedition from another country and prefer to fly directly to Dar es Salaam, we can provide you with a customised quotation. Riding: Approximately 3,200 Km total (291 Km/day average). Almost 80% dirt roads. Expected Weather: Warm humid days with a remote possibility of some rain. Tour dates were selected to fall outside Tanzania's normal rainfall season. Roads & Terrain: Good tar/paved roads, some good gravel roads, some sand and some more challenging, steep, technical sections. Arrive at Julius Nyerere International Airport in Dar es Salaam, the largest city in Tanzania, where your taxi/shuttle will be waiting to transport you to Bagamayo, where your motorcyle will be ready and waiting for your Tanzania adventure. 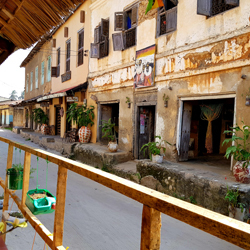 Spend the afternoon exploring and relaxing in Bagamoyo, meet the rest of your group and enjoy a great local dinner. 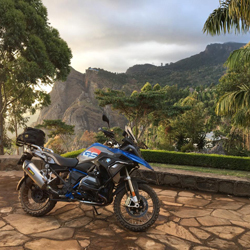 After breakfast we pack our motorcycles, and are on our way to explore the coast line of Tanzania. We make our way to the secluded, palm fringed Ushongo Beach, where we will stay at an amaing lodge for the night. Take a late afternoon stroll on the beach and explore some of the local places. Today we have a fairly short drive to Fish Eagle Point. 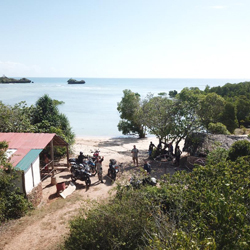 We load the motorcycles on the ferry to cross over at Pangani and make our way up a lovely coastal gravel road. After a quick stop in Tanga, we head for Fish Eagle Point where we will be in time to see a spectacular sunset from the deck. 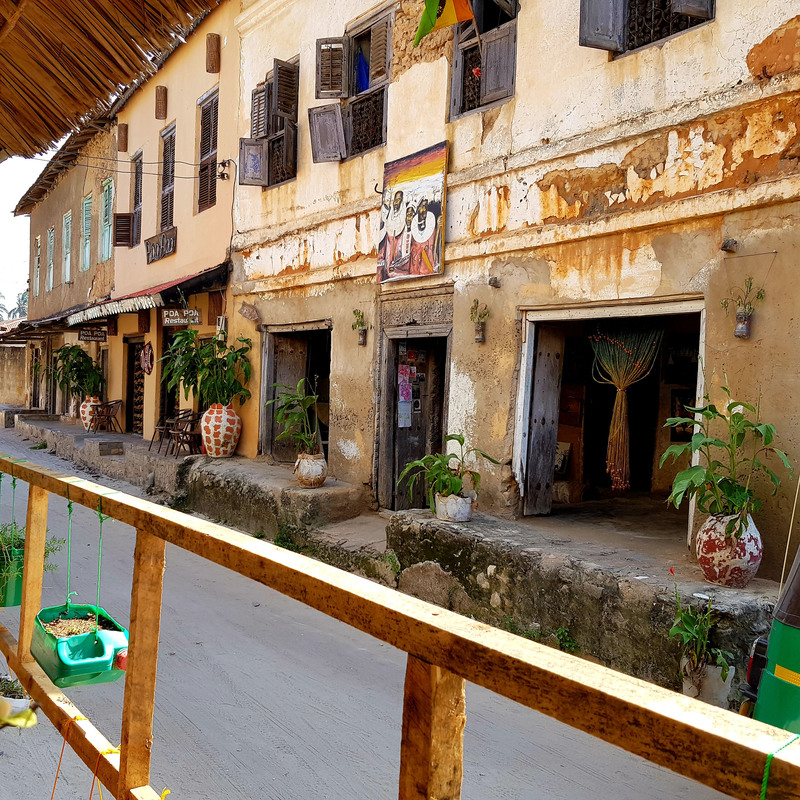 After an early breakfast we travel via winding paths and picturesque villages to Lushoto, a bustling town nestled in a shady valley. It’s the capital of the Usambara Mountain region and the heartland of the Wasaamba people. 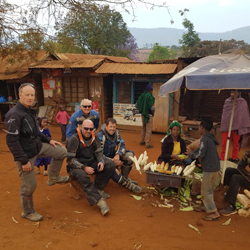 The Usambara Mountains are one of Tanzanian's highlights and definitely one of the best riding days on this trip. Enjoy the stunning views from the Irente View Point. 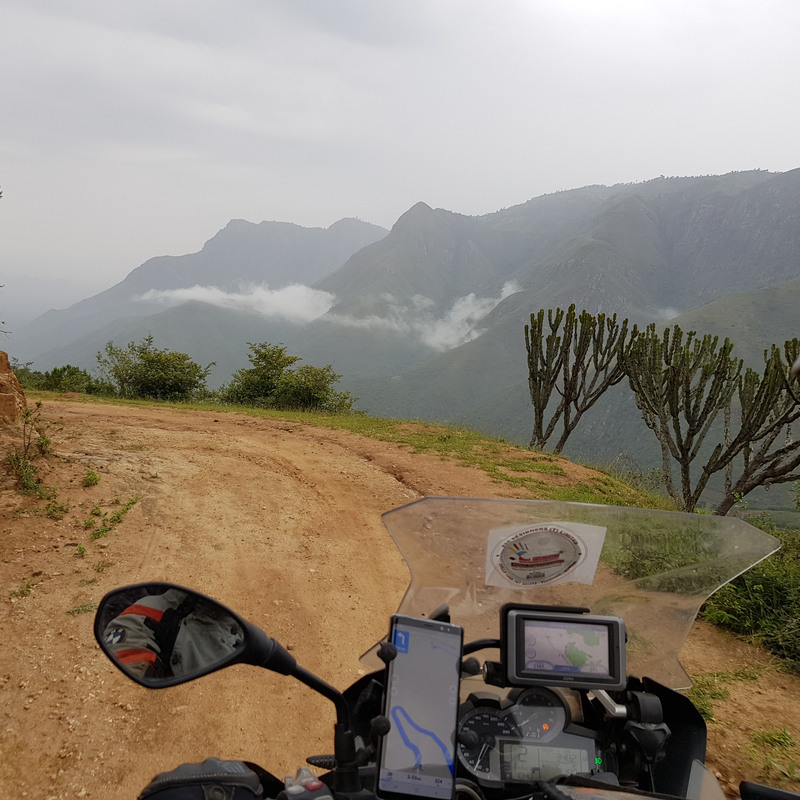 Today is a short, but interesting ride which takes us to Mambo View Point, a geniune Eco Lodge, perched high on the Northern Edge of the Usumbara mountains. 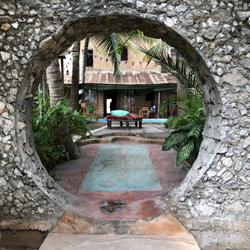 The Eco Lodge is a very unique place, with spectacular 360 degree views and the centre of a range of community projects in the area. 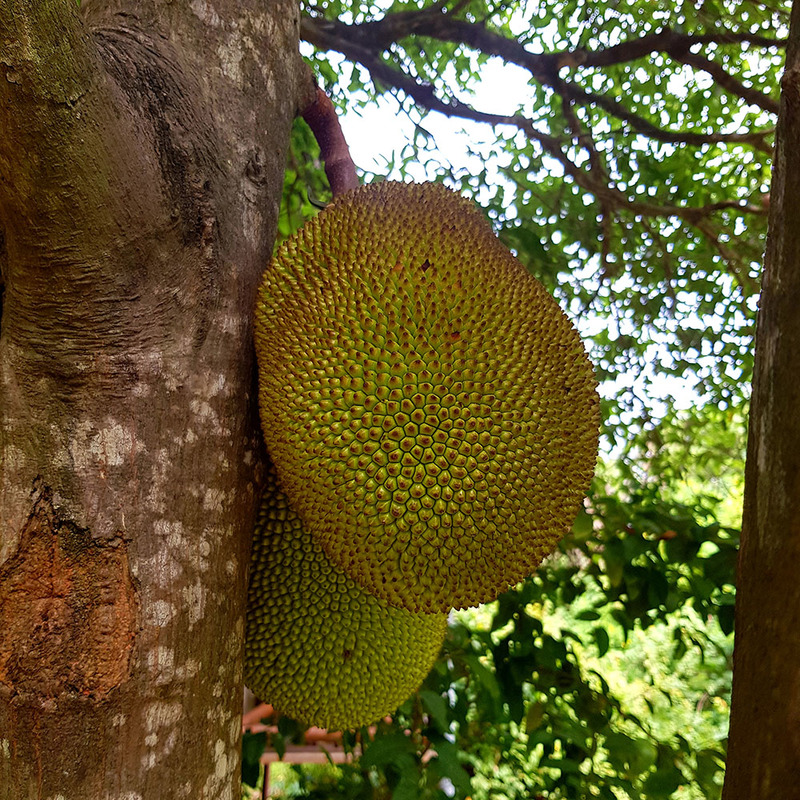 Dinner here is a delight of fresh produce from the nearby region. We leave Mambo View early for a nice technical ride down Manolo pass. We then traverse the Southern Pare Mountains towards Kilimanjaro where we will overnight close to Moshi at the foot of Kilimanjaro. 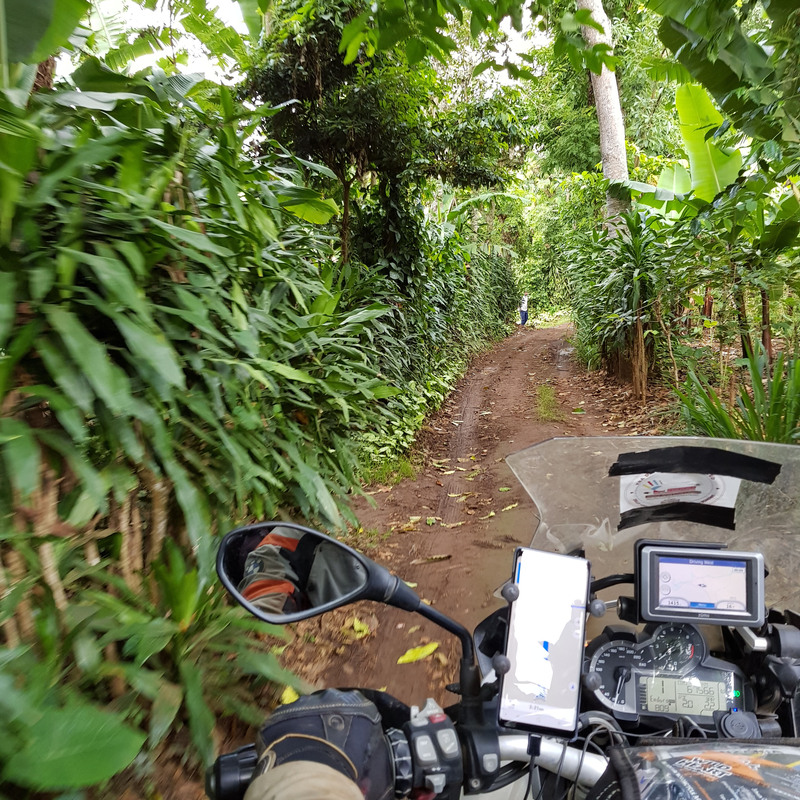 Today our route takes us on on lovely road which let us circumnavigate Kilimanjaro anti-clock wise to a lovely farm stay on the western side of the mountain. 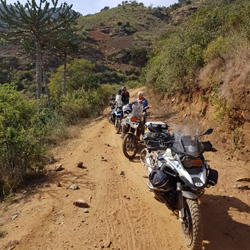 The next day, on our rest day, we give the motorcycles a rest and take a safari vehicle entering the Kilimanjaro National Park at Londorosi Gate. We end our day with sundowners on the hill, with stunning views of Mount Meru, a dormant stratovolcano, 70km west of Kilimanjaro. 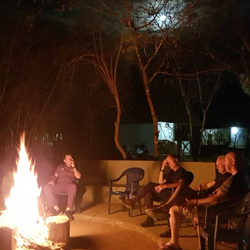 Well rested from our 2 day farm stay, we first head North West in the direction of Longido and then south to Arusha, Tanzania's gateway to the northern circuit of world class national parks. 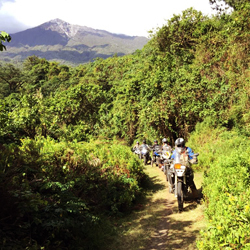 After a quick lunch, we unpack our bikes and go for an afternoon ride in Mount Meru. 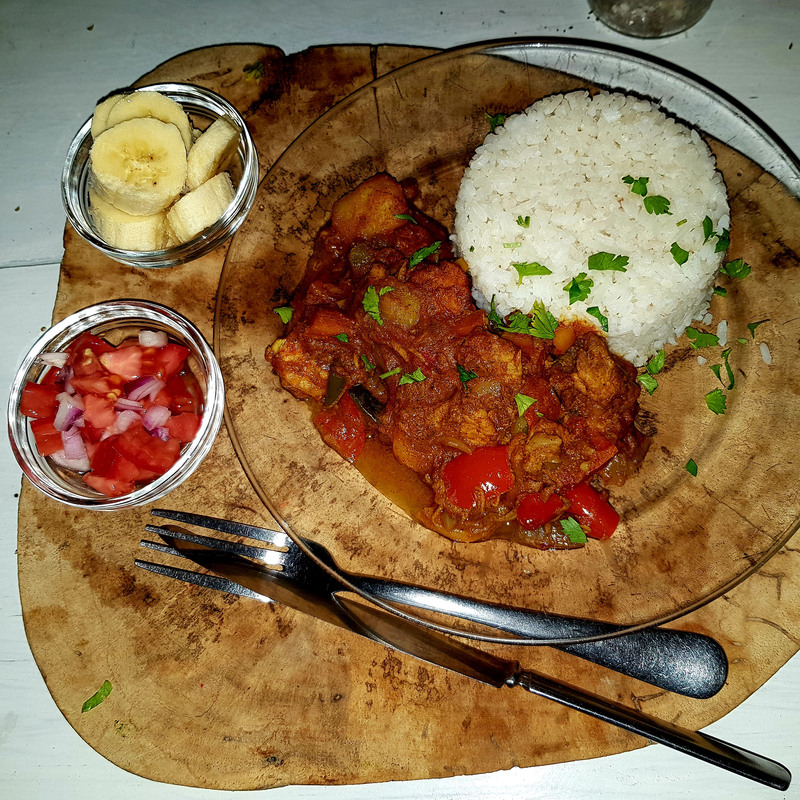 We spend the night in Arusha. 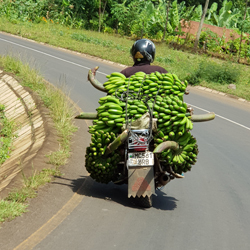 From Arusha, we take a scenic back road to Monduli and then head for Karatu via Mto wa Mbu. Tonight we stay at a lovely lodge on the rim of The Ngorongoro Crater. 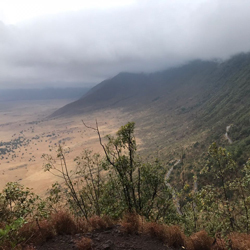 Today is a rest day and we visit The Ngorongoro Crater - the largest unbroken caldera in the world, with a local guide and safari vehicle. The caldera is considered one of the best wildlife encounters in the world and home to the Big 5. The leopard tends to be atop the crater and in the dense forest along the outside of the crater. We have a packed lunch down in the crater and head back to the lodge late afternoon. Well rested, we take some interesting back roads today towards Dodoma. Dodoma City became the official capital of Tanzania after a nationwide party referendum in 1973, when the Tanzanian government announced that the capital would be moved from Dar es Salaam to a more central location to create significant social and economic improvements for the central region and to centralise the capital within the country. We have dinner at a great Pizzeria/Italian Restaurant close to our hotel. 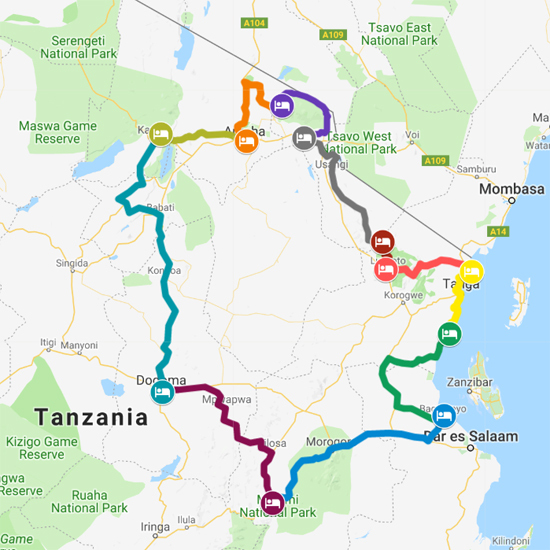 Our route from Dodoma today takes us through some interesting backroads via Chunyu, Mpapwa and Kilosa, as we head towards The Mikumi National Park where we will overnight. The Mikumi National Park was established in 1964 and covers an area of 3,230 km². It is the fourth largest in the country and adjoins the northern border of Africa’s biggest game reserve – the Selous. We spend the evening sharing stories around the camp fire. We head back to Bagamoyo through the Mikumi National Park today. 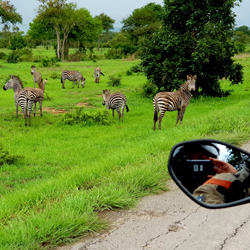 The A7 surfaced highway between Dar es Salaam and Iringa, transects the park, and often allows for great sightings of the open horizons and abundant wildlife of the Mkata Floodplain, the popular centre piece of Mikumi. We have our final dinner in Bagamoyo tonight to reflect about our experiences in Tanzania. All good things unfortunately come to an end. This morning after breakfast, our shuttle takes us to the Julius Nyerere International Airport in Dar es Salaam for our return flight back to South Africa. Adventure riding is our passion. We made it our every day job. We love to share our time and knowledge to give you the best advice on products for riding comfort, protection and enjoyment. The most amazing people walk through our doors and enter our lives. We learn and share your adventures and trips through pictures and stories. Life is about experimenting, but it is also about choices. Make the one's which work for you. Although we will always try our best to source and supply a wide range of accessories and gear (stuff we like and/or use ourselves), we can unfortunately not stock or have everything available all the time. That is life... and that is how we live it. 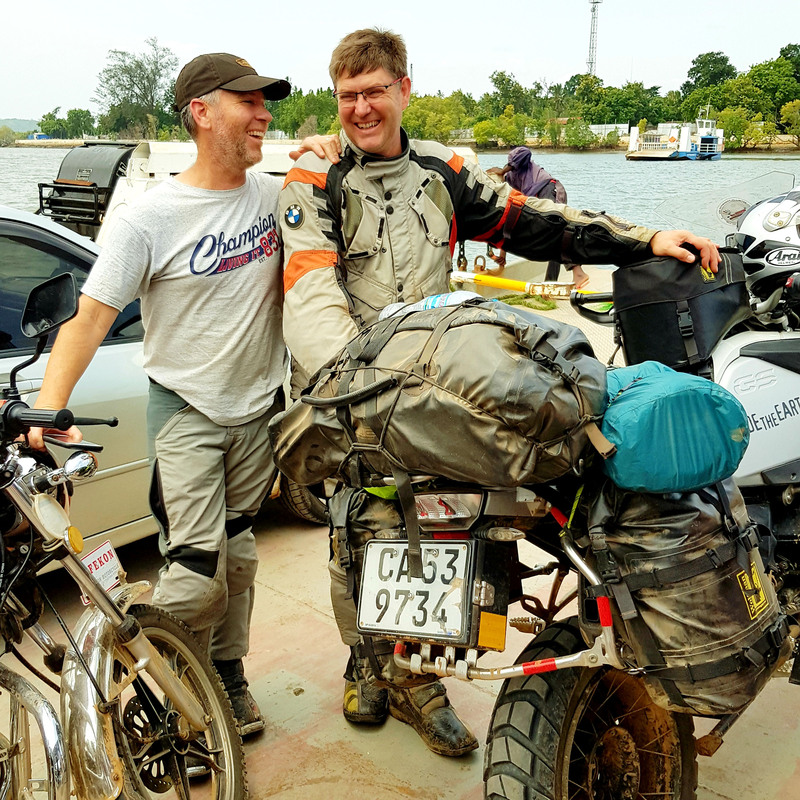 Wild at Heart Adventure (Pty) Ltd. Copyright © 2018 Wild at Heart Adventure (Pty) Ltd.